TechZone™ is the industry’s first easy-to-specify-and-install ceiling solution, with integrated technical services. The new state-of-the-art Balloch Campus in West Dunbartonshire features three highly acoustic Armstrong Ceiling Solutions throughout – Perla OP 0.95 Tegular mineral tiles on Prelude 24 TLX grid, Parafon Hygien Board mineral tiles on a 24mm corrosion-resistant grid, and Armstrong’s revolutionary TechZone™ integrated ceiling system incorporating Perla OP MicroLook planks. 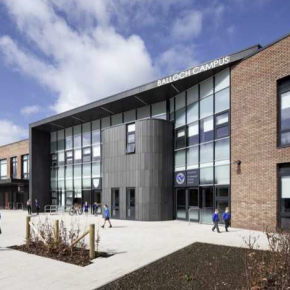 Delivered by main contractor Morgan Sindall, they were specified by architects Holmes Miller for the £16 million campus for ‘cost and quality’ reasons and installed by Armstrong’s Green Omega specialist sub-contractor Brian Hendry Interiors. As part of their membership of Armstrong’s Green Omega network of recycling installers Brian Hendry Interiors also recycled 300m2 of the new ceiling tile off-cuts during the installation process, preventing almost a tonne of material going to landfill and the consumption of an equivalent weight of raw materials. 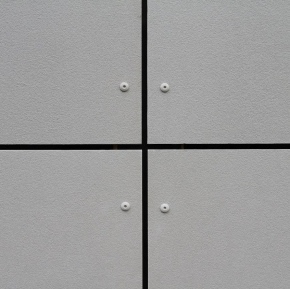 For maximum acoustic comfort some 1,600 square metres of Perla OP 0.95 600mm x 600mm tiles with a Tegular edge detail within a standard 24mm grid were used in offices, classrooms and stores. These tiles perform to Sound Absorption Class A and were also the first mineral ceiling tile in Europe to win Cradle to Cradle™ certification, as part of the new generation of sustainable and acoustic ceilings offered by Armstrong. 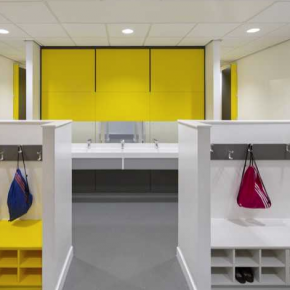 In the corridors and breakout areas Armstrong’s TechZone™ integrated ceiling system was specified with a 15mm XL2 grid, fabricated to special lengths of 900, 2100 and 2400mm. Incorporating 800m2 of Perla OP 0.95 1200mm x 300mm MicroLook, the TechZone™ system was specified to achieve the aesthetics of a linear plank system and seamlessly integrate and complement the 100mm wide linear lighting arrangement. 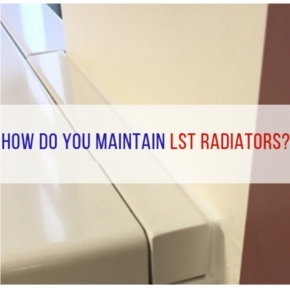 In addition, it addressed the clutter of services above in a crowded corridor installation and provided an acoustic Class A product to reduce unwanted noise in the busy ceiling plane. To complete the trio of Armstrong ceiling systems installed at Balloch Campus, 160m2 of Parafon Hygien 600mm x 600mm tiles, which offer Class A sound absorption, 95% humidity resistance and clean room classification to ISO 4, were used within a 24mm corrosion-resistant grid in the high humidity zones, such as the kitchen areas and stores. In total there are 21 open-plan flexible learning spaces for the potential 747 students, as well as a centrally-located shared administrative areas, gym halls and assembly area, while the ASN has capacity to assist 36 pupils with a varying range of support needs. 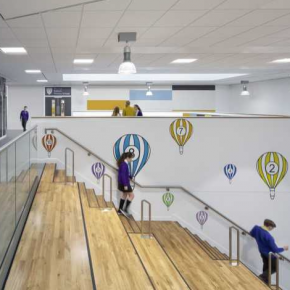 Holmes Miller commented: “The joining of three separate schools with different identities is always a challenge but early and focused community and pupil engagement informed our design from the outset. The £16 million campus represents a major investment in the education offering in the area by West Dunbartonshire Council through what is now the Scottish Procurement Alliance. 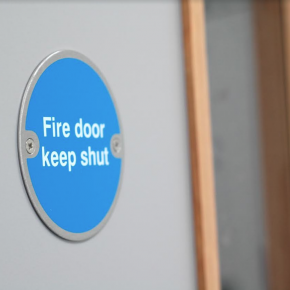 This supports the efficient construction, refurbishment and maintenance of social housing and public buildings throughout Scotland. 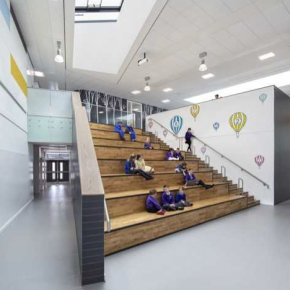 With multiple stakeholders across the three schools and the local authority, the framework procurement route afforded early-stage collaboration on design, budget and timescales. 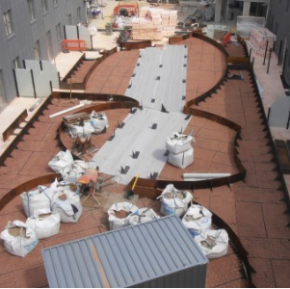 The 16-month steel frame build to BIM Level 2 was completed on schedule and to budget. Brian Hendry commented: “We were involved initially on the project to assist with the ceiling design and detailing, three months prior to starting on site, with both Morgan Sindall’s site team and the architect. “During this process we assisted with the detailing of the plasterboard bulkheads and the Armstrong TechZone™ solution to the main corridor/breakout areas due to the visual appearance the architect was trying to achieve. “As the TechZone™ ceiling system was a bespoke product, the design process was time-consuming, ensuring compatibility with the proposed services and paying particular attention during the procurement process to ensure the correct ordering of products, as this all had to be done at the front end of the project to ensure we had enough to complete.